Throughout 2017, a Texas-Arizona-Nevada trifecta has dominated the quarterly Scout Vision® Trends & Forecasts list of the top five U.S. Metropolitan Areas predicted to rise in real estate prices through 2022. But by the end of the year, there was a new (east coast) kid on the block, cracking the top five after being in the top twenty for multiple quarters: The Hilton Head Island-Bluffton-Beaufort, SC Metro Area is at the top of Scout Vision’s list of highest appreciating metros for Q4 2017-Q4 2022 (see Figure 1). Scout Vision arms investors with past median home value data (quarter-by-quarter since 2000) and future 5-year home price appreciation rates. Here, we’ll explain why Hilton Head Island-Bluffton-Beaufort, SC is a leading metro for real estate investors. The Hilton Head Island metro area, which includes Bluffton and Beaufort, is an extremely popular vacation destination for the well-to-do. The area experiences a large influx of people during the vacation season, with some taking up residence in second homes they own, while others may visit to catch the PGA Tour in tony Harbour Town. Then, as the vacation season ends, the population typically drops. However, as the oldest Baby Boomers – a generation that represents nearly 20% of the American public according to Investopedia – begin retiring to warmer climates, the Hilton Head Island-Bluffton-Beaufort, SC Metro Area has an excellent shot at making the short list for where the well-heeled are likely to become full-time residents. In fact, it is already happening: The area is becoming more “year-round” with the same people who vacationed here now buying in to live here permanently. The metro is forecast to experience strong property appreciation, with the Median Home Value expected to rise nearly 60% over the next 5 years (see Figure 1) to $406,571 (see Figure 2). 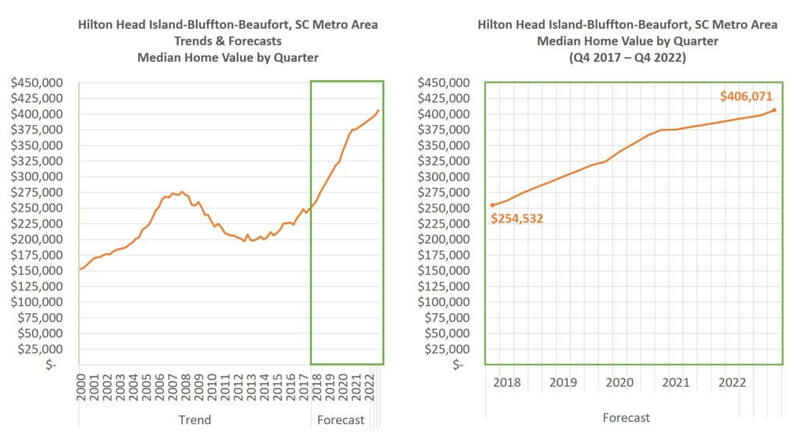 Furthermore, homes in parts of Bluffton and Beaufort are relatively secure in terms of holding onto their value in a downturn – very important for retirees living on a fixed income. The McAllen-Edinburg-Mission, TX Metro Area, roughly 70 miles from South Padre Island and the Gulf of Mexico, is a very affordable option for investors. 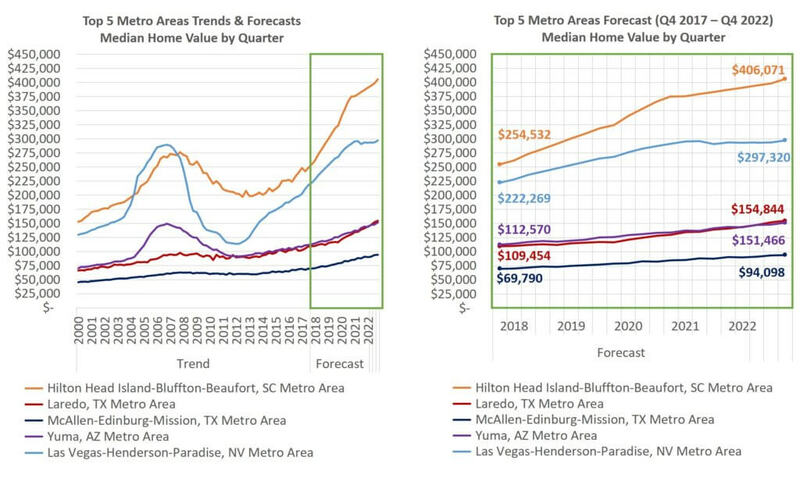 While home prices aren’t high in the Metro, as a percentage they are forecasted to rise 35% (see Figure 1), with the average Median Home Value jumping from $68,240 to $94,035 (see Figure 3). The Las Vegas-Henderson-Paradise, NV Metro Area has nearly everything going for it. 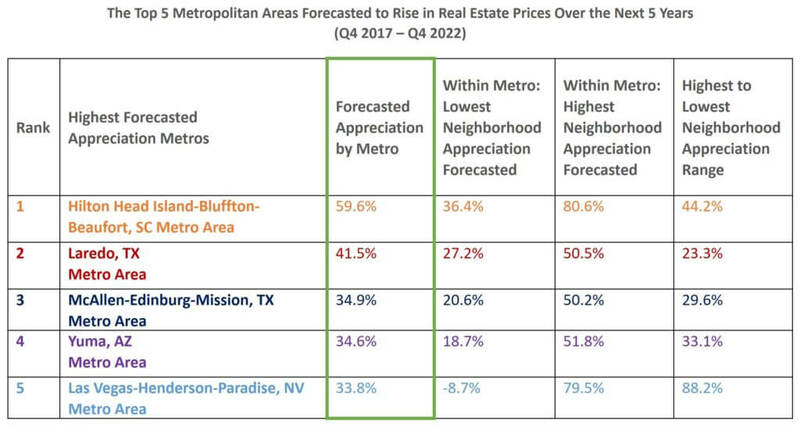 In almost every category Scout Vision tracks, the metro is back on trace since the 2008 recession, with Median Home Values expected to increase nearly 34% (see Figure 1) to $297,320, in 2022 (see Figure 3). The sunny Yuma, AZ Metro Area sits astride the California border but it is remarkably affordable (see Figure 3). Loved by snow birds for half the year, the area is experiencing strong job growth, solid wage increases, numerous housing starts, and rapidly falling vacancy rates indicating strong demand. Scout Vision predicts the metro’s Median Home Value will rise nearly 35% over the next 5 years (see Figure 1). Stay tuned for the second part of our quarterly Scout Vision report, where we will reveal historic trends and forecasts for the Top 5 U.S. Metropolitan Areas Predicted to Fall in Real Estate Prices Over the Next 5 Years. Metropolitan areas are ranked by overall forecasted appreciation. But the lists above also highlight significant variation in forecasted appreciation by neighborhood within each metro. Sometimes the variation from the lowest forecasted appreciation neighborhood to the highest can be greater than the overall forecasted appreciation for that metro. 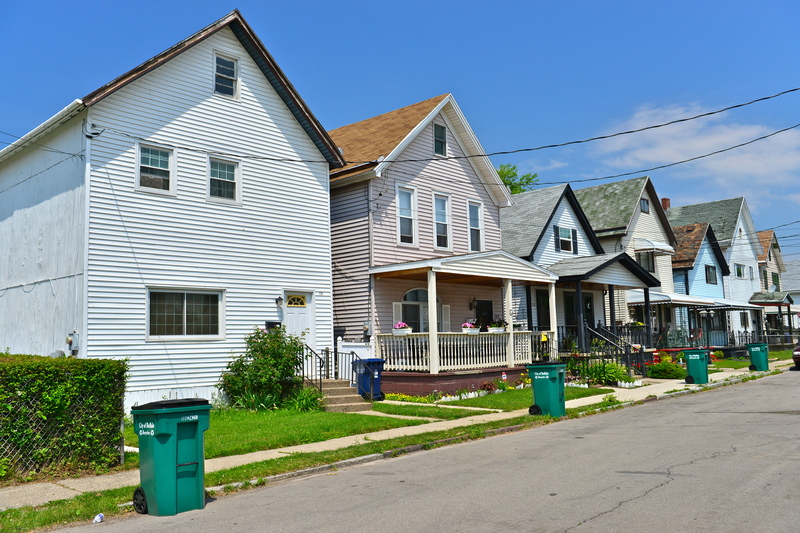 This reveals that – as many investors, lenders and appraisers have experienced – much of the opportunity and risks depend on where in the metro area the subject property is located. Not just the broad ZIP Code, but the specific Micro-Neighborhood. Industry veterans and PhD geographers developed Scout Vision by drawing on over a decade of research and development and leveraging the latest geo-statistical techniques and theory. Scout Vision’s 5-year Micro-Neighborhood™ Home Price Forecast is based on 200+ independent variables, 35+ unique data dimensions, and 21 custom, geographically nested, hierarchical models that capture market forces which operate at various spatial and time scales to drive price changes block by block. Thus, Scout Vision uniquely identifies otherwise unseen opportunity by generating home appreciation projections that combine unprecedented geographic precision with up to 90% predictive accuracy. For real estate investment firms with 500+ properties or companies needing API or large bulk file processing, request a data sample of up to 10 addresses and discover what Scout Vision Enterprise can do for your firm. For real estate investment firms with fewer than 500 properties or individuals with independent investments, take advantage of Scout Vision’s forecasting capabilities through a NeighborhoodScout Pro Subscription.